I've had long hair almost all my life, which means I can be picky when it comes to conditioners. Run-of-the-mill drugstore conditioners often leave my hair soft by tangly, making combing a painful an unpleasant process. I've sought out more specialized products such as intensive conditioners to use simply for their detangling properties. 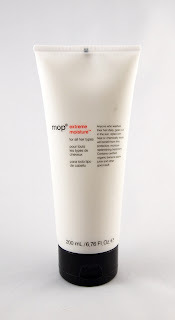 MOP (Modern Organic Products) makes a hydrating conditioner that is light enough to use 1-3 times per week: Extreme Moisture. I liked how this conditioner left my hair more manageable than many "budget" conditioners. However, for the price, it is fairly light in texture, and so it can be easy to use it quickly, as a regular conditioner. I appreciated how it had a light, pleasant scent and washed out easily. I was disappointed to see that this rated a moderate 6 on EWG's Skin Deep database. This was largely due to an unspecified fragrance and parabens, which are surprising to see in a line with "organic" in the name. I would love to see this reformulated with safety and vegans in mind (it currently contains honey). I would also love an updated manufacturer website that allows me to easily view information on and purchase their products. Otherwise, this conditioner performs well as a more intensive conditioner for use 1-3 times per week.